Sumire is a great story told by a very poor storyteller. Kataoka Tomo has a knack for coming up with interesting troubled characters and touching stories, but his prose leaves one with very much to be desired. He also seems to have great trouble at keeping his characters even somewhat realistic, and representing the supposedly real world in a believable fashion is totally beyond his abilities — to an extent it makes me wonder if he’s writing from some parallel dimension with alternate laws of common sense (but in reality he probably just hasn’t left his house in twenty years and forgot how real people behave). These problems weren’t as evident in Narcissu as it only had two characters, and the whole experience was surreal enough to easily disregard the obvious lack of realism. Unfortunately, I can’t say the same about Scarlett which was an international spy thriller so far removed from reality it turned to sheer comedy. Luckily, Sumire is more of an emotional tale that was not as easily ruined by Tomo’s failing grasp on reality. Still, had the same story been written by an actual master writer (like Romeo, Jackson, or Loose Boy) it deserved, we’d probably have an ageless masterpiece on our hands. Now, sadly, it’s just all right. Sumire concentrates on the internet relationship between a guy and three girls (some of whom pose as men online) — all of whom have serious communication issues in the real world. It explores the differences between one’s face online and outside, and concentrates on bringing the girls to accept their real world inadequacies and stop them from running away into fantasy worlds. In this sense Sumire reminded me of Ore-tachi ni Tsubasa ha nai, and darn, you know you have something on your hands when it reminds you of *that*. 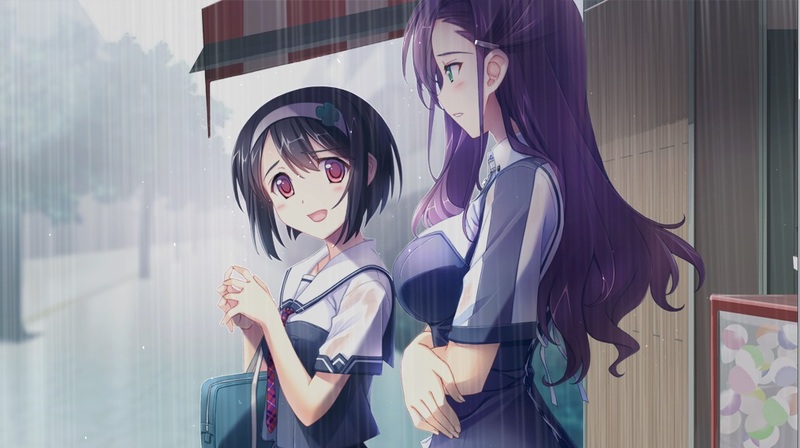 The premise is positively fascinating, and the characters are both intriguing and likable, and it seems it can’t go wrong until you notice that Tomo decides to take care of big chunks of character development off screen (effectively making the story feel cheaper than it should), has absolutely no idea how to maintain a consistent protagonist (the guy has a completely different personality in every route), and tends to introduce new concepts out of nowhere with no foreshadowing whatsoever (near the end you learn that the protagonist has been supposedly looking for his childhood’s sweetheart for decades despite him not showing a single hint to the fact till then). 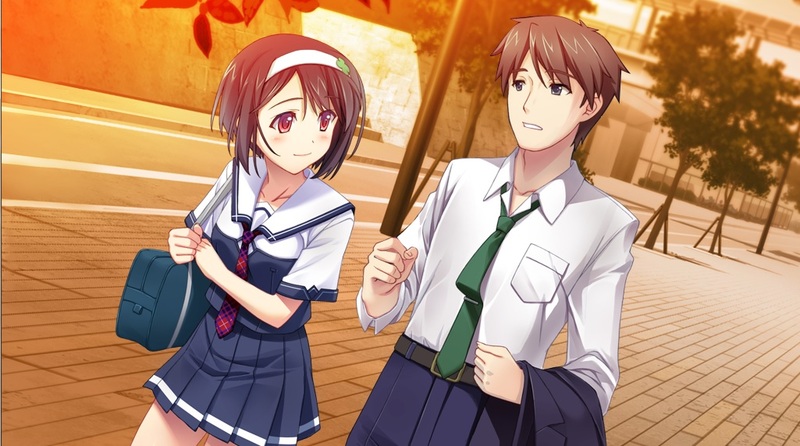 Nonetheless, if you, like me, can suppress your suspension of disbelief and can willfully ignore the plethora of plot holes and steadily poor writing just because of fascinating ideas the work tries (usually unsuccessfully) to tackle, you will probably enjoy Sumire’s and Hinohime’s routes quite a lot. Especially since they are very likable characters in their own right (Hinohime’s disregard for real people is particularly awesome). 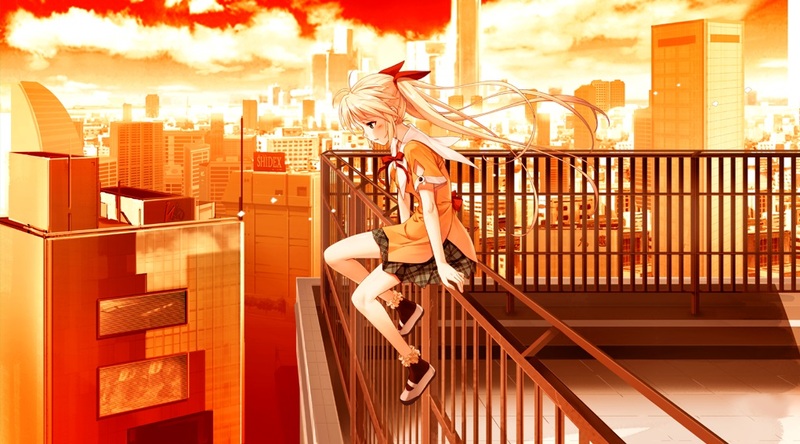 Unfortunately, regardless of your ability to turn a blind eye to the inconsistencies in the plot, you will probably still have a lot of trouble with Tae’s route as it’s there where the story tries to tackle real world a little as opposed to exclusively emotional issues, and starts falling apart as per usual thanks to Tomo’s inability to make sense. He even attempted to introduce some sort of strange urban horror/fantasy plotline that was so ridiculous even he had the good sense to scrap it in the middle, attributing it to something akin to “It was all just a dream.” I wish he had the good sense not to include it into the game at all, though. Tae’s route is also very unevenly paced with many important scenes seemingly skipped and random bloat added just to fill the space (the aforementioned horror plotline). 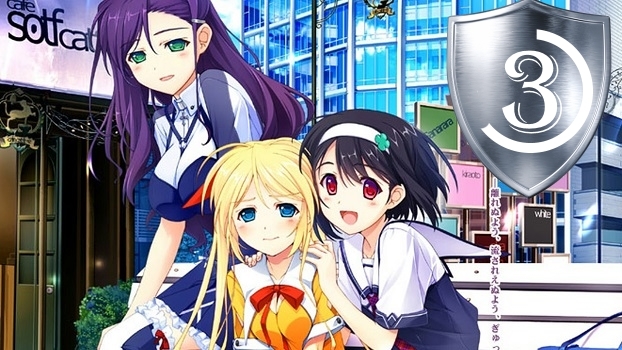 Quite frankly, it feels like the game was released unfinished; and I’m not talking about the lack of polish here — Hinohime doesn’t even have an ending, and Tae’s route ends so abruptly I was absolutely bewildered by the meaning of credits suddenly rolling (you don’t even reach the H scenes, they get unlocked in extra and are set in some future timeline that the game never reaches). Nonetheless, Sumire is still about the most “literary” fun I had with a VN this year, and despite a plethora of absolutely infuriating flaws, it’s a visual novel very well worth reading that follows in the footsteps of thought-provoking emotional works you’d rather expect someone like Romeo to write (and oh how I wish it was Romeo who wrote this T_T). P.S. To give an example of Tomo’s failure to grasp reality on the most basic level let me recall one of the scenes from Tae’s route: Two hospitalized children, each of whom have a bed in a different room, play together at night in the hospital in one of their rooms when a nurse barges in and tells them it’s lights-out time, and that they should go to sleep right away. She then proceeds to turn off the lights and urges the two children to sleep before leaving (no attempts were made to return the kids to their own room, and the room in question has only one bed to boot). Tomo basically needed two children together at night, and failed to realize the way he brought them together made no sense. And the whole game is littered with scenes like that; so better come prepared, lol.